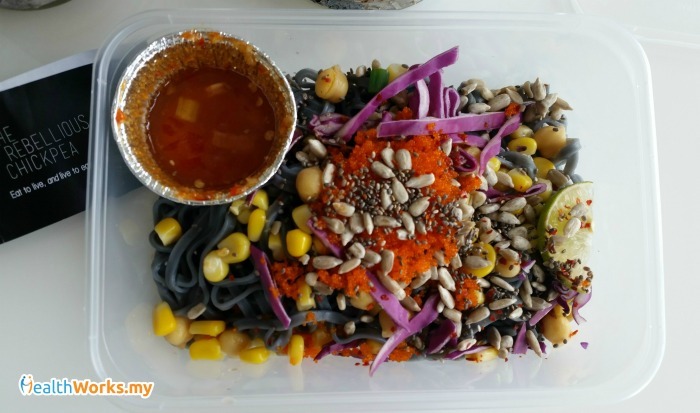 Malaysia is an awesome country to live in if you’re a foodie. Wherever you are, you can be sure that you’re only steps away from something delightful that’ll tantalize your taste buds. 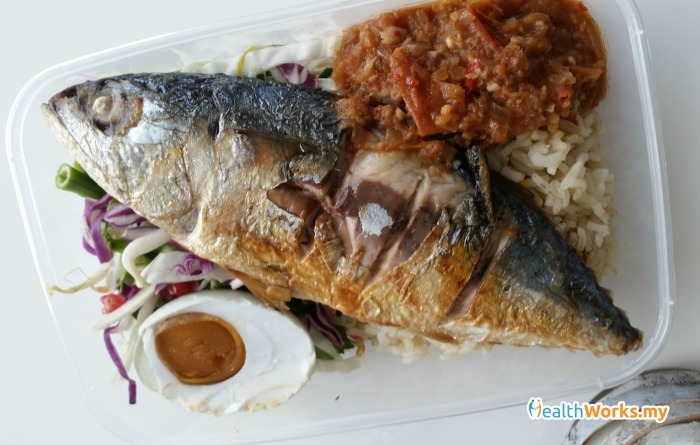 However, when it comes to healthy, nutritious food that’ll feed not just your taste buds but your body, Malaysia is sorely lacking. It is because of our cheap, easily-attained oil-laden curries and deep fried goodies that we are currently ranked most obese in South East Asia. Well, okay, perhaps our lack of fondness for physical activity is also partly to blame. In an effort to live healthier, I’ve always been on the lookout for affordable, yet nutritious food during lunch hour. The local hawkers and barai-barai offer very few healthy options, so I would always go to the economy rice stall and search for the veggies and protein with the least oil sheen. Not an easy task. Of course, the best option is always to cook at home, but let’s face it, not everyone enjoys cooking and not everyone can make the time. First delivery! This came around 12.30pm, which was great as it was the usual time I had lunch. How it works is that you get a call telling you they’re at your doorstep and you’ll need to go pick it up. I did that and came back with this baby. Thumbs up for the tasteful packaging! 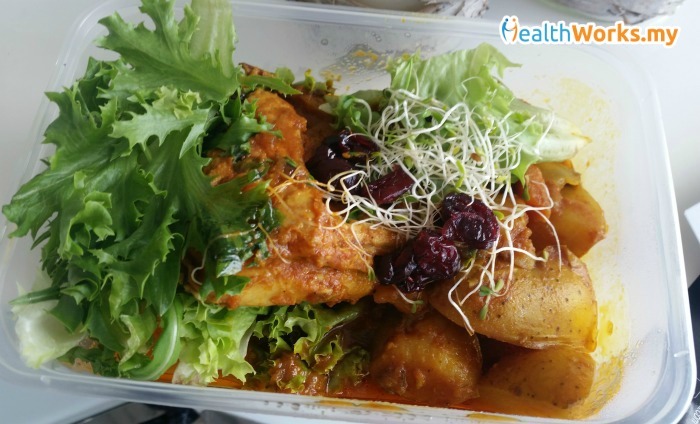 What’s in the box: Coq Au Malaise, which is Rebellious Chickpea’s healthier version of ayam percik using kampung chicken. 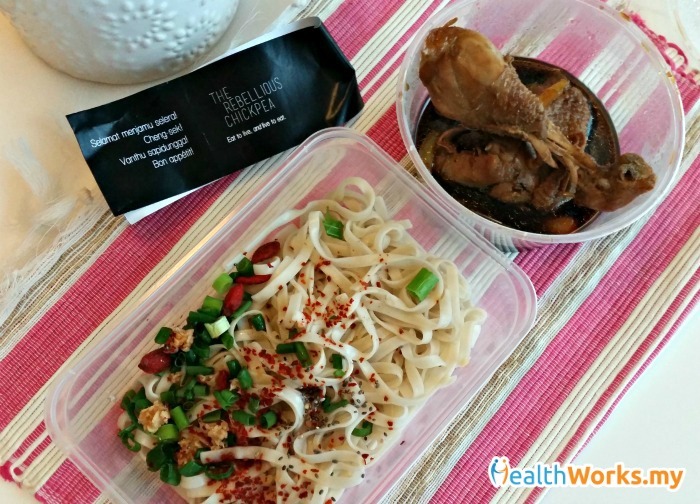 What’s on the plate: After transferring contents onto a plate (because who likes eating from a box?! 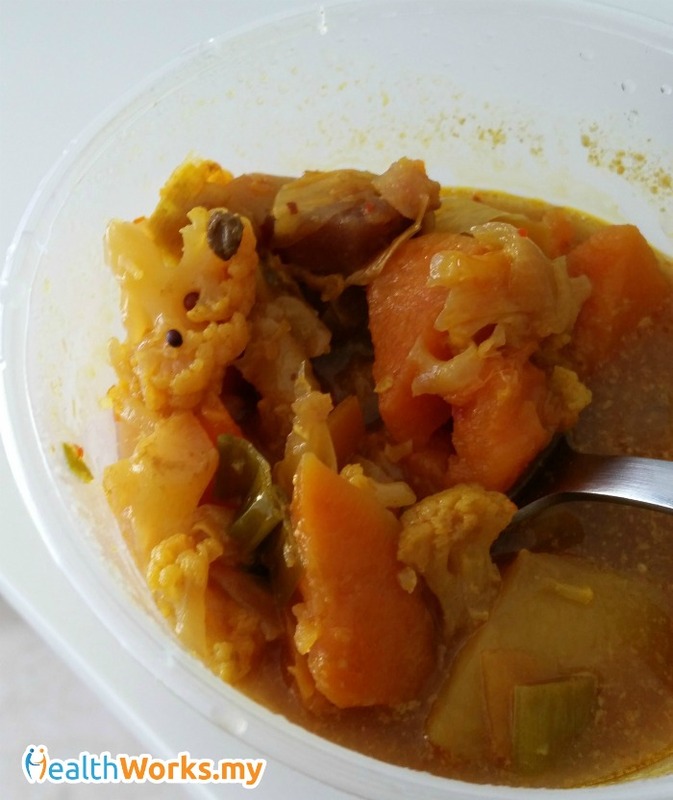 ), I noticed that there was actually a healthy portion of veggies, sprouts and potatoes with skin on. There was also enough sauce and dried cranberries to go around. 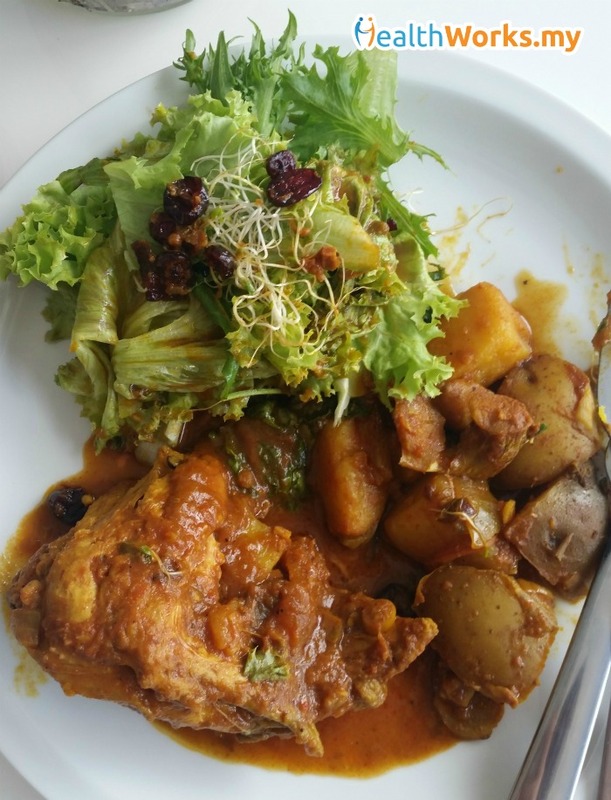 Taste: The sauce was not overpowering, with just enough flavour to brighten up the potatoes. Veggies were fresh and the dried cranberries added a delightful hint of sweetness to the whole thing. Chicken was tender and well-cooked. No hint of any unhealthy stuff like excess oil etc used, so no complaints here. Verdict: I was impressed and looking forward to Day 2. On their weekly menu, every Wednesday is “Surprise Me Wednesday” which means you won’t know what you’re getting. When I went down to the lobby to collect my lunch from the smiling Rebellious Chickpea girls I was pleasantly surprised by the blast of colour in the box. What’s on the plate: Upon further inspection, I noticed chia seeds in the mixture of seeds as well. There was also a homemade sweet chilli sauce and a wedge of lime. Taste: This was fantastic. I loved how everything came together so well when married with the awesome sauce. The seeds, corn, and chopped veggies added some crunch and I was licking the plate when I was done. Verdict: Overall, this was a very nice meal. However, I’d prefer the noodles to be a bit more al dente (was very soft for my taste). Perhaps a bit more chopped veggies would balance the meal out as this seemed rather carb-heavy. 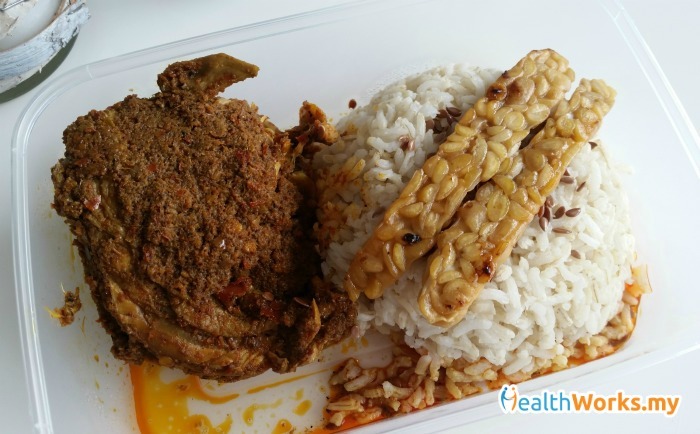 I was looking forward to this meal because I loved rendang and wanted to see what a healthier version of rendang looked like. 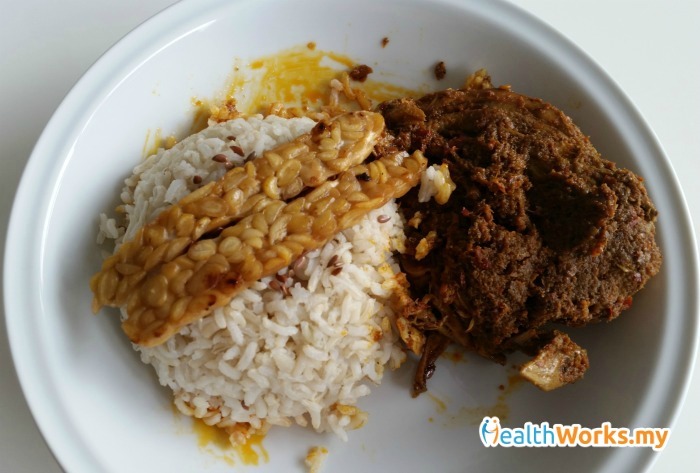 What’s on the plate: 1 piece of chicken rendang, 2 slices of tempeh, and brown rice, and what appears to be some flaxseeds. Taste: This didn’t quit hit it for me. It wasn’t bad, but it wasn’t very memorable either. While the chicken was tender, the spices lacked some kick and the flavour didn’t seep into the bones. 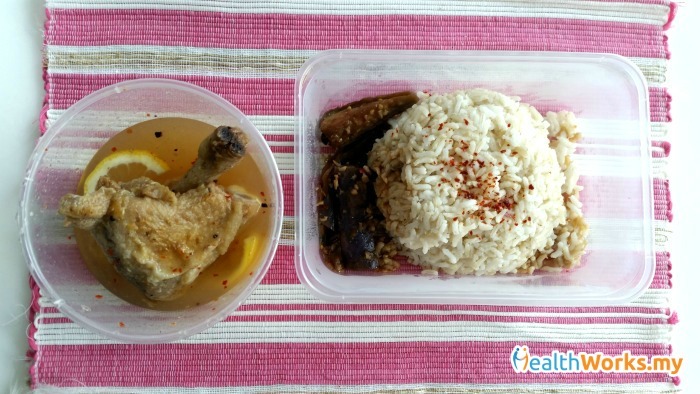 The rice also takes away some flavour when paired with the chicken. Verdict: Would’ve been nice to see some veggies in this dish. Perhaps a simple acar or veggie pickle would complete the dish, or even just some salad leaves. Didn’t feel awfully healthy eating this, but glad to see only minimal oil. 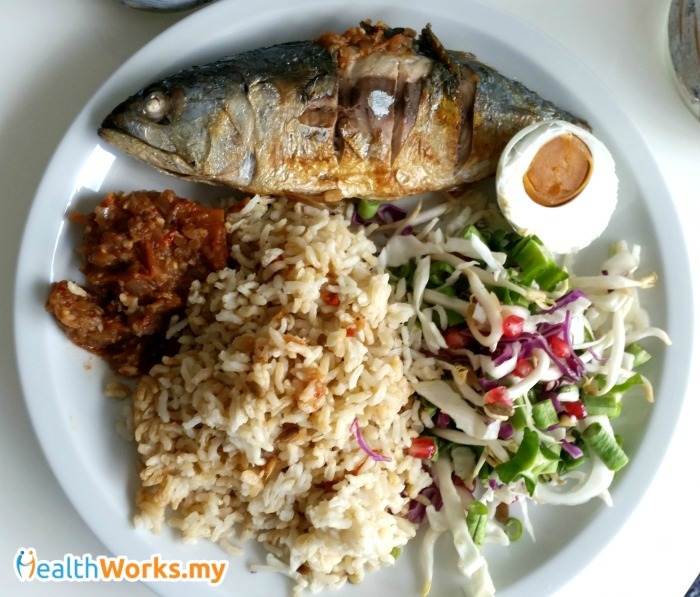 Nasi kerabu is one of my absolute favourites and I was super excited to see what the Rebellious Chickpea people made out of this quintessential Malaysian dish. Taste: This wasn’t bad overall. The veggies added a nice crunch and I loved the ingenious addition of pomegranate seeds which gave a pop of sweetness in my mouth whenever I caught one. Sambal was lovely too. Verdict: Although definitely nowhere near as delicious as your artery-clogging nasi kerabu, this was a good healthier take on it. Glad to see that the fish was pan-fried instead of deep-fried. However, I think they could’ve been more generous with the sambal as I ran out halfway (or maybe I was just sauce-heavy). Portion was also huge and I couldn’t finish it. 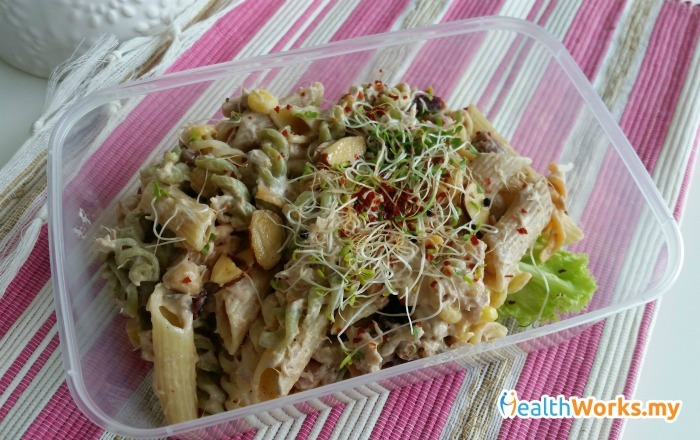 Pasta salads are always my guilty pleasure because although they’re called “salads” they’re nowhere near innocent. 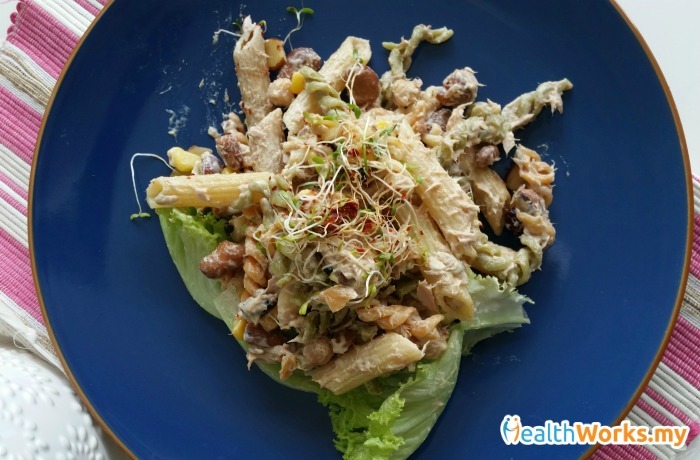 What’s on the plate: A mixture of regular tube pasta, wholegrain tube pasta, and veggie spiral pasta plus chickpeas, beans and sweet corn. Topped off with chilli flakes, toasted almond flakes and sprouts. Taste: I loved this dish. It was super yummy and creamy, with a slight hint of sweetness. The beans and chickpeas added some substance to the meal. Pasta was al dente, which was great for me. I don’t know what they used to toss the pasta in but I sure hope it’s not mayonnaise. Verdict: Would definitely order this again. Wished the portion was slightly larger though as I didn’t get very full with this. Also, instead of mixing in regular pasta, it’d be great if all the pasta used was wholegrain. More salad greens would be good as well. My mom made a mean chicken with ginger and spring onion so I had certain expectations for this dish. 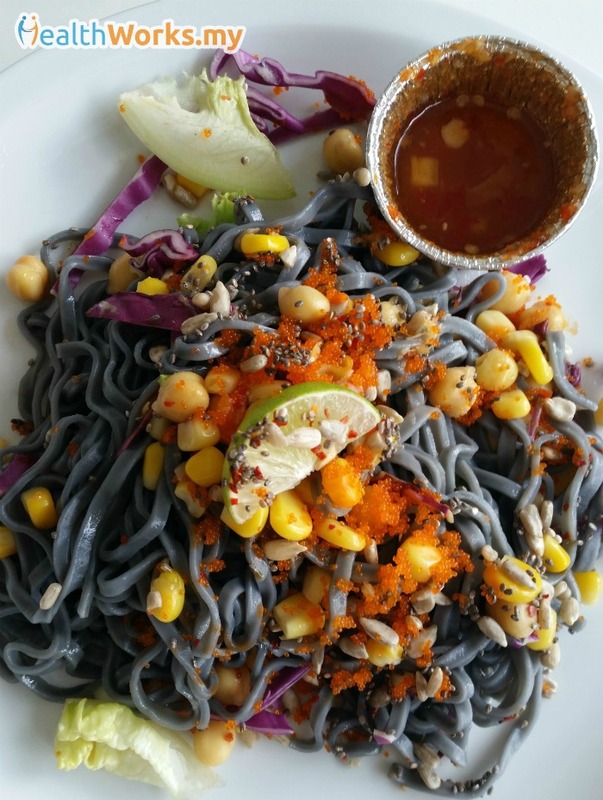 What’s on the plate: Some noodles topped with fresh spring onions, chilli flakes, goji berries, chia seeds, and some fried garlic. 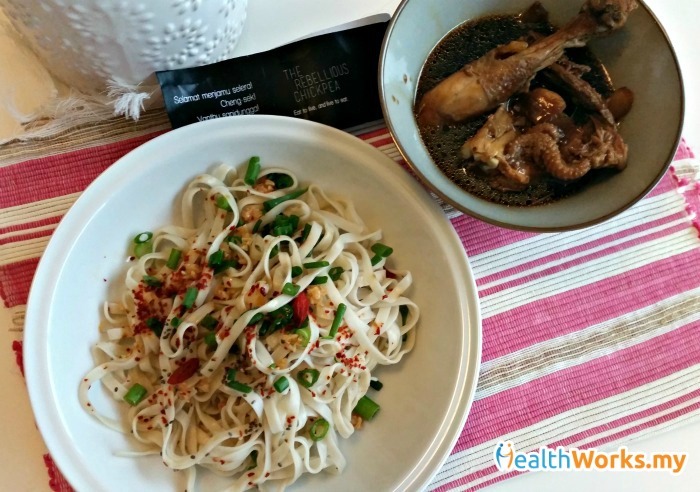 What’s in the bowl: 2 pieces of kampung chicken in a dark sauce with ginger. Taste: Chicken was very tender, almost falling off the bones. Goji berries were a great addition of flavour, but overall the dish was lacklustre and rather bland. Noodles were too soft for me as well. Verdict: Pretty unmemorable, probably wouldn’t order it again. 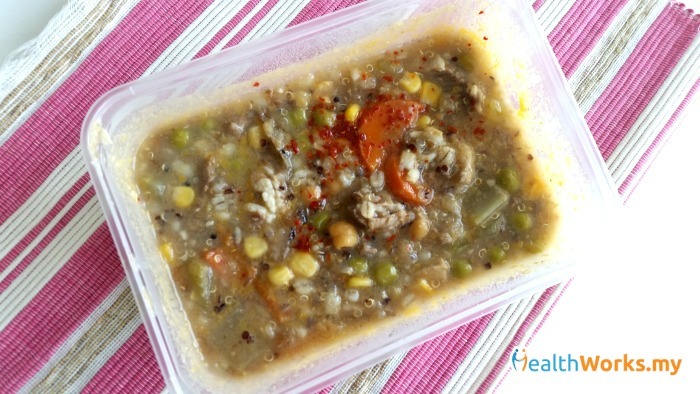 What’s in the box: Beef stew with quinoa, beans, barley, chickpeas, peas, etc. Taste: This didn’t cut it for me. Flavour was bland and could do with more spices. Beef however, was very tender. Verdict: This dish rates high on health points, being packed with beans and veggies. However, it was a very uninspired dish for me and I didn’t (or couldn’t) finish it. Taste: Instead of using regular potatoes, I believe this was made with sweet potatoes. It added a hint of sweetness to the dish that was lip-smackingly good. Lots of chopped onions and veggies in the dish, which was great. Pita bread was okay, nothing special (I suspect this was not homemade). Verdict: Who doesn’t love dipping soft bread into a hot cauliflower stew? This was a nice Thursday meal but I could’ve done with a larger portion of aloo gobi as I only got half of a small container, which wasn’t quite enough. 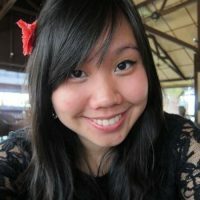 Can one make lemon chicken without deep-frying the chicken and putting loads of sugar and thickening agents into the sauce? 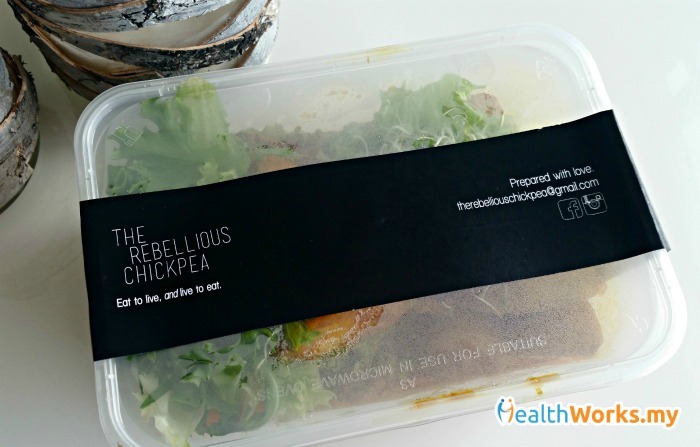 Let’s see Rebellious Chickpea’s take on this favourite Chinese dish. 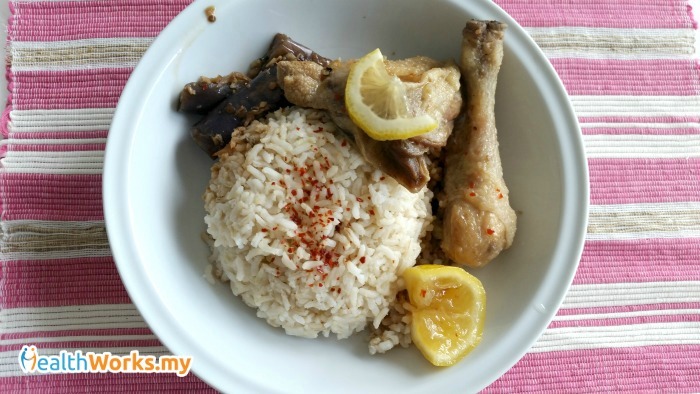 What’s on the plate: 2 pieces of kampung lemon chicken, eggplant, brown rice topped with chilli flakes. Taste: Mmmm… this was soooo good. The sauce was packed with the essence of the chicken and lemon. 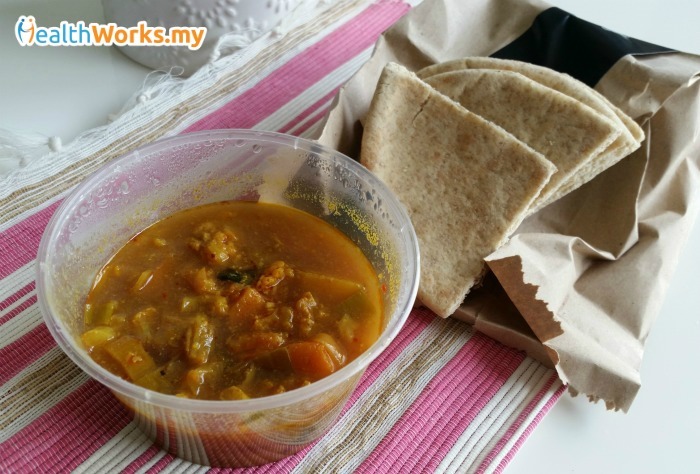 The flavour soaked through the tender chicken pieces and this went great with brown rice. The tangy sweetness was very refreshing on the tastebuds. 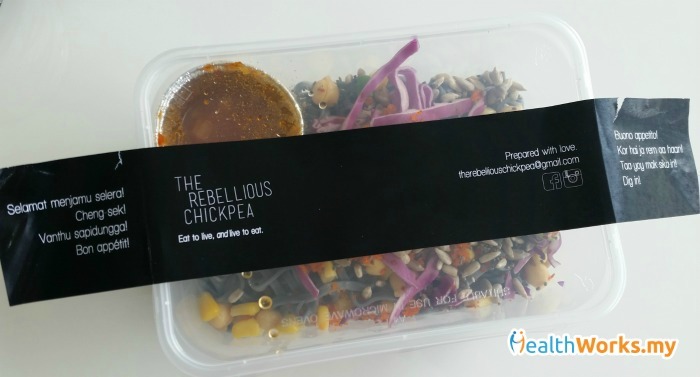 Verdict: I truly enjoyed this meal, and it was apt that this was the last day I was trying out Rebellious Chickpea. It was a good finale to my two-week stress-free lunch delivery. 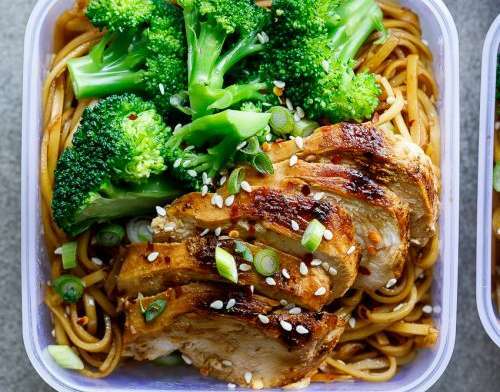 I loved how for 2 weeks I didn’t have to worry about what to have for lunch, or having to head out despite my schedule in search of food. The food was mostly nutritious offerings, which was great. There was one day where I had to step out during delivery hours and they happily sent me my food early upon request. That was very nice. Very fair pricing for delicious dishes inclusive of delivery (if you order for a a week within their coverage areas). Nice people running a nice intimate business. Inconsistent serving sizes, but this could easily be fixed I believe. Some hits and misses, so not all items are fantastic, but most were great tasting. 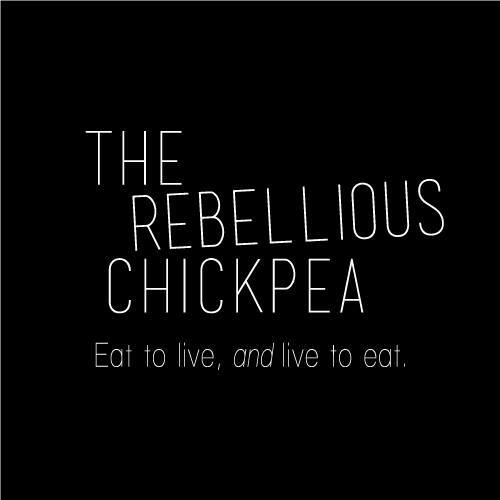 The Rebellious Chickpea posts up lunch menus for the week over the weekend on their Facebook page. You could either choose to buy single lunches or weekly lunches.